Poor Cinderalla is taunted by her evil step-mother and sisters. Will she ever escape and meet her Prince Charming? This is the Cinderella play in which Ashes, the magic cat, first appears. When Cinderella is left alone to do the work, Ashes helps her as easily as he’d catch a mouse. When the others go to the ball, he stays with Cinderella. He gives up his pumpkin for her coach and his nice fat mice to make the horses. 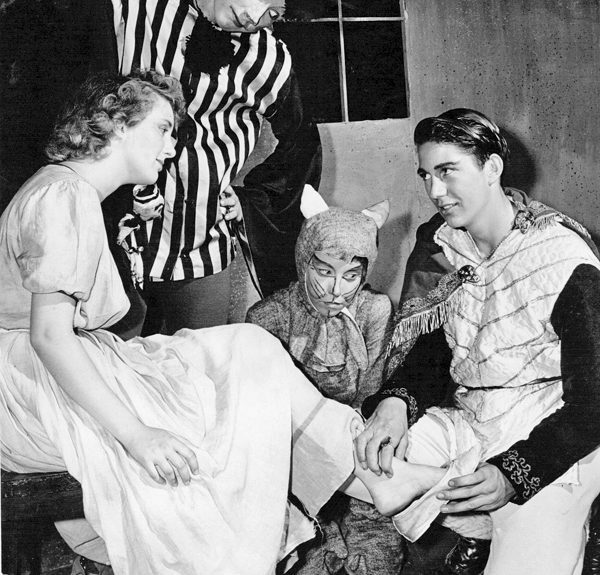 Written by Frances Homer, Cinderella of Loreland was billed as a “Modern Three-Act Version of the Beloved Fairy Tale.” It was first performed in 1933 at the Century Drawing Rooms in Philadelphia, by the Philadelphia School of Expression and Dramatic Art, under the direction of the author. Homer also wrote The Sleeping Beauty of Loreland. In 1948, the San Diego Community Theater’s Junior Theater Workshop was established at the suggestion of its resident director, Craig Noel. The next year, his collaboration between San Diego Community Theater and San Diego State College (now, SDSU) led to the founding of the annual San Diego Shakespeare Festival. Junior Theatre playwright George Carroll Rice says of the collaboration, “by their agreement, the City of San Diego provided the Globe Theatre in Balboa Park and its facilities; and San Diego State College hired internationally famous Shakespearean director B. Iden Payne to teach one class and direct one play during the summer session. The State also paid the expenses of faculty production personnel and materials.” Assisting Payne were Hunton D. Sellman and Robert Ford Corrigan of the San Diego State College drama department and Marvyn Harbert, technical director of the Community Theatre. 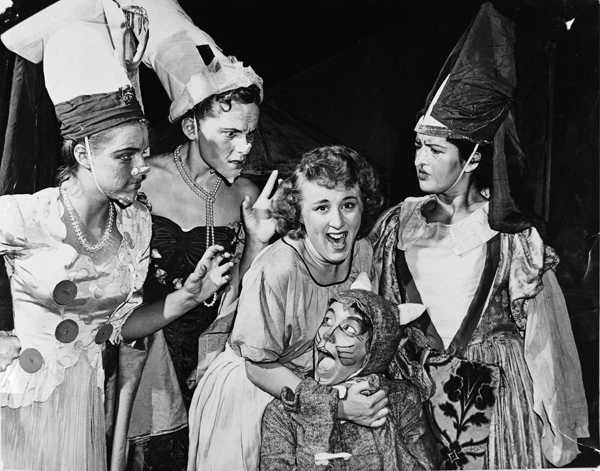 Cinderella of Loreland was San Diego Junior Theatre Workshop’s inaugural production, performed in July, 1949 on the heels of the Shakespeare Festival in the Roosevelt Junior High School auditorium. Directed by Mary Corrigan, Marion Ross and Jack Wagar (both classmates at San Diego State College, Ross played Lady Olivia in the Globe’s Twelfth Night), In addition to acting, students in the workshop designed and executed the costumes and sets. Shown own two weekends with alternating casts to accommodate all summer-session students, tickets for Cinderella of Loreland cost 35¢ for children, 50¢ for adults! Cinderella, a Moderen Three-Act Version of the Beloved Fairy Tale, aka Cinderella of Loreland, written by Frances Homer. Presented by special arrangement with the Children’s Theatre Press (now Dramatic Publishing Company of Woodstock, IL). Production sponsored in part by the San Diego Community Theater, the City of San Diego Park and Recreation Department, and the City of San Diego. 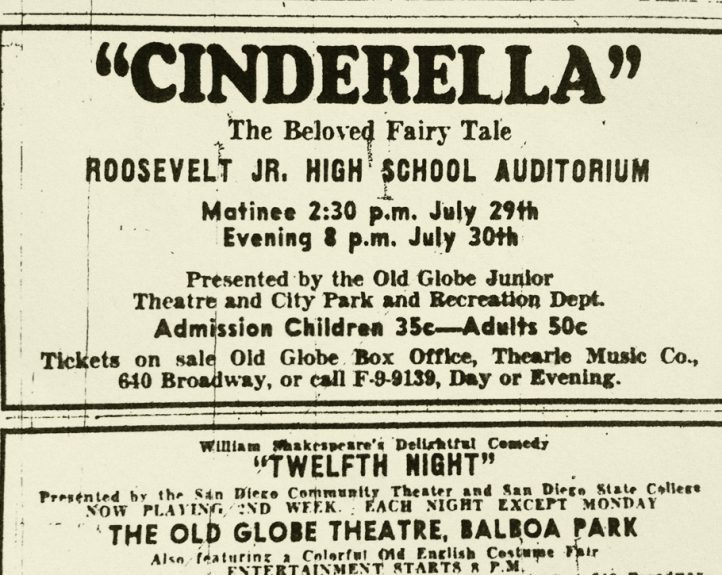 Sources: San Diego Union, 25 July 1949 c-4, 29 July 1949 a-11; The Lively Arts in El Cajon, 1892-1952, by George Carroll Rice, El Cajon Historical Society; and Everything Old is New Again: A History of San Diego Junior Theatre, 1948-2008, by Darlene Gould Davies and Lizbeth Persons Price, The Journal of San Diego History, Winter/Spring 2009.